Poor Harry ! If only Mrs. Rowling knew what kind of bad game EA made with her young wizard hero, she might want to take the license back from them. 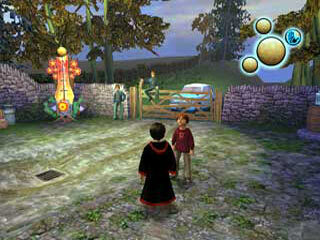 At first, Harry Potter and the Chamber of Secrets looks like a fine game with nice graphics. 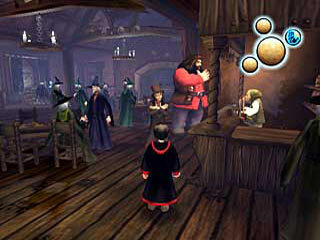 Everything is rather enjoyable in The Burrow, where the game begins and where you learn the basics. You collect things, cast Flippendo on a bewitched washing machine, toss trolls over a wall, etc. However, the fun turns short. Once you are really into the game, unless to be a crazy Harry Potter fan who loves the marketing rubbish as much as the books, you realize you're playing quite a silly game. The story is very badly told, many important scenes from the book have been removed or changed so that the whole thing now looks like some stupid and grotesque TV series a kid like Dudley Dursley would enjoy. Above all, the action and the gameplay of the game are terrible. It is so annoying whether you have to sneak, fight or just talk. Sneaking and fighting especially, the controls are awful. If you try to sneak, you just get caught because it's so slow and awkward. It's better just to rush and try to see something by pulling repeatedly the C stick to force the camera up ! When fighting, the lock system is crap, it's lacking of accuracy and it's too slow. The enemies drive the player crazy: most of them can't be destroyed or reappear after a little while, and each time they hit you, you lose your Bertie Bott's Every Flavour Beans. 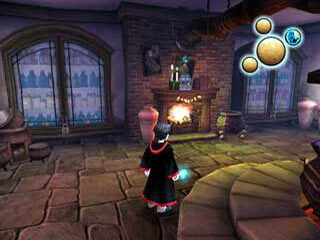 The most enjoyable, or rather the less detestable in the game is to fly on your broom. It's fine as long as it is not during a Quidditch match which are so amazingly restricted that you wonder what the fun is all about. At first, Harry Potter and the Chamber of Secrets gives a really nice impression thanks to the graphics; at lenght though, it's about frustration, repetition and severe boredom. Even the graphics unveil their ugly side, from the faces to the backgrounds. The disk access is also incredibly bad, it's loading all the time when playing the music ! (I wonder if it can spoil the GameCube ?) If you want to spend your muggles' money wisely, you'd better buy some decent video games and all the Harry Potter books a second time than considering paying for such a stupid, stupid game. 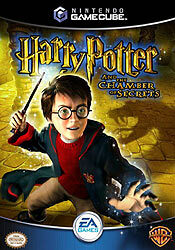 "Be Harry Potter and unlock the mystery at the heart of the Chamber of Secrets. With dire warnings from strange quarters and dark schemes afoot, Harry's second adventure will be every bit as magical and dangerous as his first. But this time the spells are more potent, the foes are more fearsome, and Harry�s friends are more important than ever. Cutting-edge graphics bring Harry's world to life like never before. Go deeper into Harry's second adventure - a faithful representation of Harry Potter and the Chamber of Secrets, with greater magic control and more advanced spells. Featuring Wizard Duels, Powered Up Spells, Quidditch and all your favorite characters including Ron, Hermione and Gilderoy Lockhart! Take flight around Hogwarts - Hop on your Nimbus Two Thousands and explore the magic of Hogwarts and its grounds like never before. Connect your GameCube to a Game Boy Advance to unlock secret areas and mini-puzzles."